Bansky, an artist who focuses on social commentary with visual puns like a good poke in the eye, recently created a farmyard for fast food. Where else would those little chicken nuggets get there start? Chickens have been on my mind lately, having spent a few weeks with 2 of them this summer. They have a lot of personality and according to some tests, score higher than monkeys. But the reality of how they are treated is very different. The 2006 film “Our Daily Bread” showed how tomatoes were handled with more care than live baby chicks. 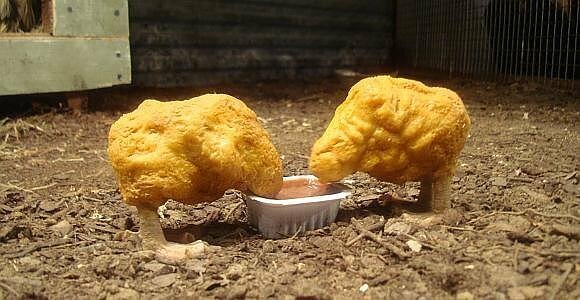 Just on their way to nuggethood, that’s all.